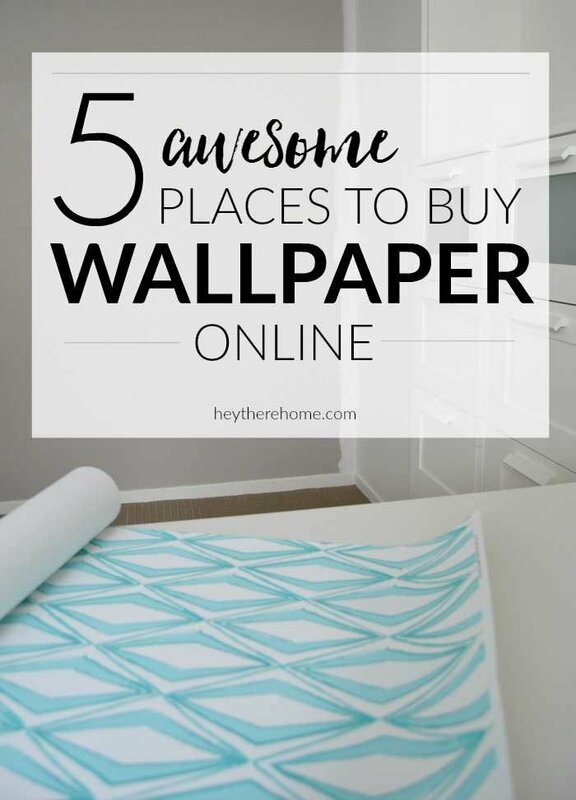 Inside: I did a little digging and came up with 5 awesome places that you can find wallpaper online! I was in third grade when we moved into a new home and the weeks that followed were nothing but peeling wallpaper. Rainbow wallpaper, floral wallpaper, even cork wallpaper that was a half inch thick. Peeling, peeling, and more peeling all in the name of making it our home, with our style. My mom had a vision, and it didn’t include any of these crazy wall coverings. So I guess you could say I grew up with a definite aversion to wall paper, but every time I go into a model home (so fun right?) the thing that gets me every time is all of the pattern, especially when it is done so well all over the walls. That got me thinking more about wallpaper and after doing a bit of research I realized that wallpaper has come a long way! That’s right, you can actually do wallpaper with very little commitment, and when you get sick of it you won’t have to sacrifice the finger tips of your little ones because so many beautiful wallpapers come in peel and stick now and they are adjustable, which means little mistakes along the way are okay! My first experience with repositionable wallpaper was the beautiful turquoise and white diamond pattern that I hung in my office and I’ve had so many reader questions about it. So I thought I’d do a little digging and come up with 5 awesome places that you too can find wallpaper online. Let the pattern play begin! Etsy has an incredible selection when it comes to different styles of wallpaper. Seriously, you will find so many amazing floral patterns, geometric patterns, or even really subtle texture like patterns on here. The coolest part is that many of the patterns you see come in a variety of colors. There are also a variety of price points, which is awesome. 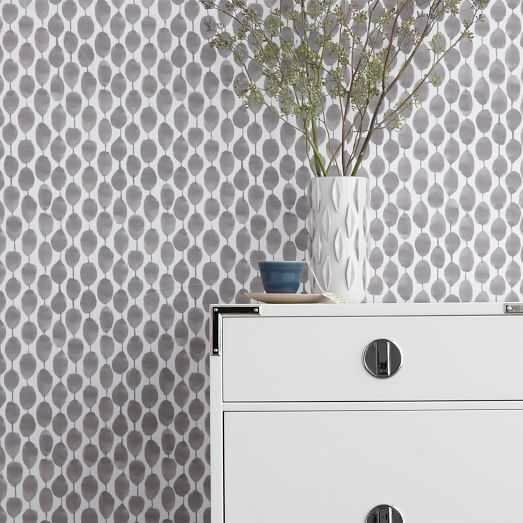 I know you probably thought that West Elm was just for furniture, but in the past few years they’ve started offering wallpaper to complete your hip look! They’ve taken a few of their best prints and turned them into wallpaper! And yes, they are the peel and stick kind so they are easy to remove! This is where I found the wallpaper that I used in my office and I love it! There is so much to choose from on this site, so to cut down the overwhelm be sure to use the selector at the top to search by color or by tag to narrow down your search. If you’ve been on Spoonflower before and have seen a fabric you love, it might also come in wallpaper! One more note before we move on, the repositionable wallpaper that I bought was an option. They do sell the glue kind too so be sure to select the right one when making your purchase! 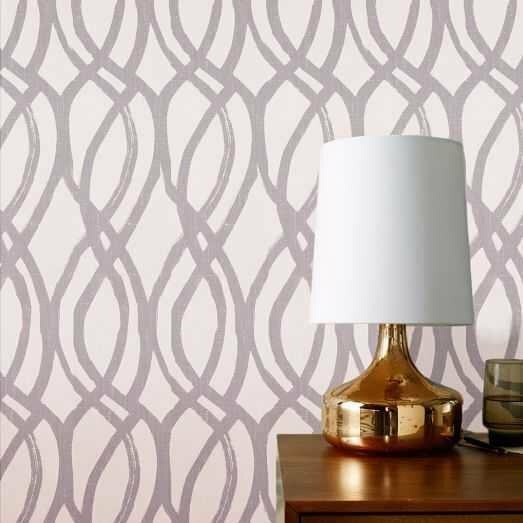 Target has teamed up with some high end wallpaper designers to offer repositionable wallpaper at really nice prices. The selection is way less overwhelming and the basic prints come in colors that would go nicely in most homes. Anthropologie has a great selection of prints with more traditional or earthy style. Their vibe is definitely worldly and collected with a feminine touch, so their wallpapers do the same and the colors are just too good to pass up. So do I have you craving a big shot of pattern yet? 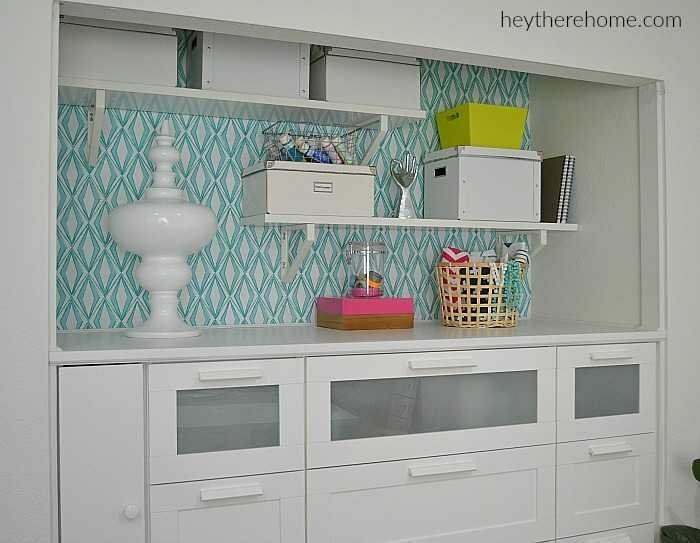 If you’ve been wanting to take a little risk with your decor adding wallpaper to the back of a bookshelf or to one wall is a great place to start! Heck you could even start small and frame a few large pieces. Happy wallpaper hunting and don’t forget to pin the image below for future reference! An Easy Mental Shift That Has Me Decluttering Like Crazy! We are setting up a vintage parlour in a museum and would like to find paper for the 1920 era. Any suggestions? Hey Margaret, that sounds fun! I’d directly contact any of the online wallpaper companies listed and ask for help. I’m sure they’ll point you to specific patterns. Good luck! Thank you so much for this. I never would’ve thought of Etsy for wallpaper, but thanks to you I found the PERFECT print for my project! That’s awesome Jen!! Happy you found inspiration here! I totally want to wallpaper everything!! Love the peel and stick wallpaper!! Great resource list, thanks for sharing. There’s a new website called Walls Need Love you would probably really like. IT’s all peel and stick for renters!! Hey Kathy! I just met them at SNAP and can’t wait to check them out. Thanks for the info!